PHUKET: A four-car collision on Thepkrasattri Road southbound in Phuket this morning caused a two-kilometer-long traffic tailback. The accident, which occurred near near the Isuzu Showroom in Koh Kaew at about 10am, left a traffic tailback all the way to the Heroines Monument in Thalang. Phuket City Police arrived at the scene, at the northernmost fringe of their jurisdiction, at 10:45am. Fortunately nobody was injured in the accident, which could have been avoided if the drivers had kept safe braking distances between their vehicles. 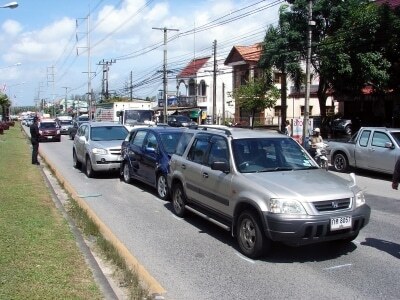 Long traffic tailbacks are a common result of even minor accidents in Thailand, where motorists who can’t agree on who was at fault keep their cars in place until police and insurance adjusters arrive.